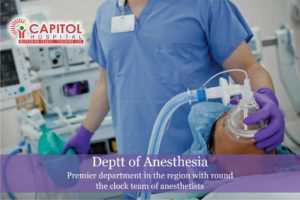 At Capitol, we ensure our best to provide a comprehensive range of clinical services, including preoperative anesthesia services, critical care medicine and pain medicine. Our patients receive advanced medical care provided by highly trained and skilled physicians. Our philosophy from day one has always been to work with a multidisciplinary team approach. The department of anesthesiology is the premier department in the region for the practice of general and regional anesthesia. The foundation of this department is the clinical skill of our anesthesiologists. We have a dedicated round the clock team of anesthetists who are assisted by pre-operative checkups and post-operative pain management team and a critical care team. Local anesthesia involves injecting drugs into the skin to numb a small area. Sedation involves drugs that produce sleepiness or a light sleep but stop short of general anesthesia.